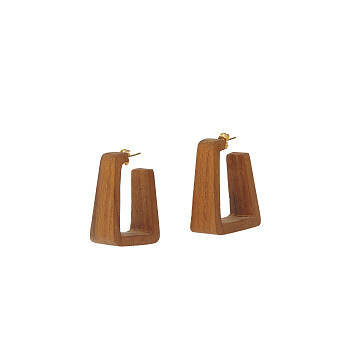 This bold, teak wood take on hoop earrings helps its Kenyan maker earn a good living, close to home. How do you refresh a traditional jewelry type? Get playful with materials and dimensions. This unexpected take on hoop earrings, for example, nails it. Handcrafted of sustainably sourced wood and recycled brass by Kenyan artisans using traditional techniques, the chunky, teak wood silhouette adds bold shape and cool style to any outfit. Even cooler, the makers have been plugged into the world market by working with Nairobi-based fellow B Corp Soko. They've been able to increase sales and raise their incomes while working close to home and taking care of their families. It’s a refreshing example of win-win. Handmade in Kenya.